As a beauty addict, I normally read about new products on the web, and research them to death before deciding to go and buy things. On the rare occasion, I will spontaneously buy something that I see when I am wandering around. Sometimes these spontaneous purchases don't pan out for me, other times they become something I absolutely fall head over heels in love with and decide I can't ever do without. Just a couple of days ago, I walked past the Body Shop in my lunch break, saw the word 'Camellia' in the window, and walked out twenty minutes later poorer but in love. I've only had them for two days and am obsessed. I know it's only been a short time, but these products are just that good, I couldn't wait to share. Body Shop launched the Spa of the World collection only this week, and aims to bring you to a spa within your own home, with treatments/ingredient focus from around the world. They have five different steps in their different 'rituals' for this range: Scrub, Treat, Relax, Nourish and Massage. Each step has a few different options within them, so you're not limited to just a choice of five products. I had the joy of having the two scrubs and creams put on my hands. Naturally it was two of these that came home with me. 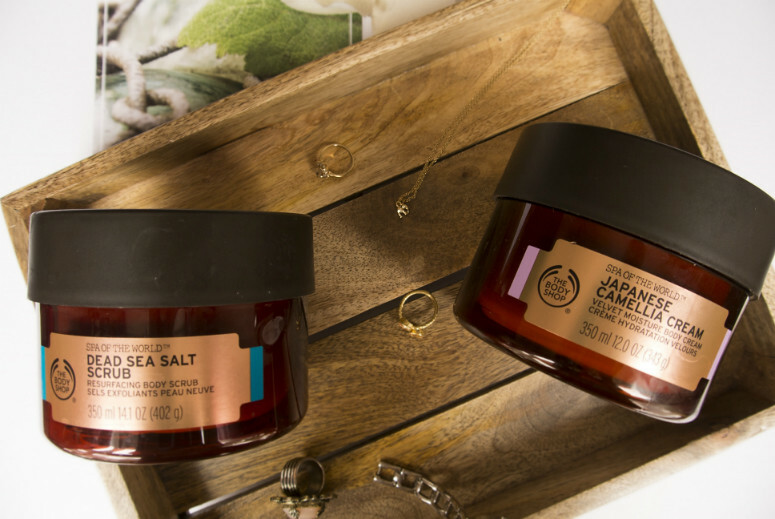 The Dead Sea Salt Scrub is a wonderfully rich scrub that is part of the 'revitalising' ritual, aimed to lift up your energy when you're feeling a bit run down. I can definitely see why this scrub falls into this ritual. The salt flakes are huge, so if scrubbing these in doesn't perk you up, I don't know what will. They crumble relatively easily, so don't worry about them being too harsh on your body. Obviously, please don't go all out scrubbing them in. Unless of course that's how you like to use scrubs. If you have skin problems like eczema (such as myself), you may have been told to bathe in Dead Sea Salt. If you don't have a bath or prefer showers, then this scrub will be a great alternative. What I find even more impressive about this scrub is the fact it actually moisturises my skin at the same time. It's got sunflower oil (you know, in case you want to fry something on yourself. Joke. ), sunflower seed oil, mango seed oil and soybean oil. You will come out feeling buttery smooth, and very relaxed in that calm, soothed way, thanks in part to its uplifting marine-citrusy smell. The Japanese Camellia Cream is described as a velvet moisture body cream, and I wouldn't disagree with this description. Looking at it in the tub, it looks like a heavy-set mousse moisturiser but smoothed on it feels very velvety and luxurious. It sinks in quickly and penetrates into your skin quite deeply (though this may be because I've used the Salt Scrub beforehand), leaving your skin comfortably moisturised for hours afterwards. The scent is slightly sweet and floral, but not overbearingly so, which is ideal for me because sickly sweet gives me headaches. 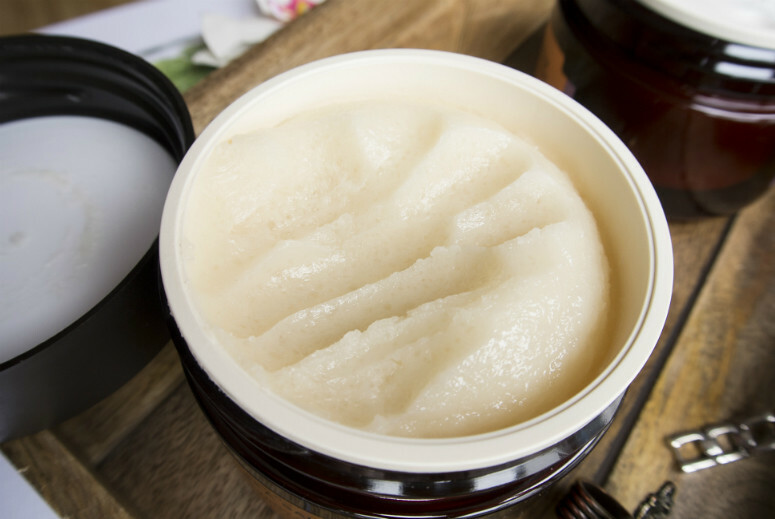 The ingredients include shea butter, mango seed oil, and of course the main draw, Camellia Oil. Camellia oil is rich in oleic acid which is great for giving you smooth and hydrated skin. Putting this on after using the Salt Scrub in my shower prepares me for bed really well, because it seems to settle my mind and take away all the busy thoughts that were in my head, so that I can get to sleep more easily. The Spa of the World Collection products are the not the cheapest things to buy from the Body Shop, but they are possibly the most luxurious thing I have seen come out of there for a while. In their dark brown packaging, quality ingredients and delicate fragrances, I think they deserve the price point. Pretty to look at in the bathroom and shelf, glorious to use, well done Body Shop for making something that stops me in my tracks. I heard from the assistant that the range is only limited edition, but not-so-small part of me is really hoping this isn't the case. If it is, I strongly urge you to get yourself either to the online shop here. What are you waiting for? These two sound like they go amazingly well together. I really love the sound of Camellia cream. They really are amazing. Apparently they're both the bestsellers, and you can really tell why!